Hurry to the Vermillion’s spooky swamp fort where Time Twins Acronix and Crux have captured Master Wu. Dodge the Snake Mech’s dangerous swishing tail and eye missiles. Evade the egg falling from the fort’s roof and free Wu from the prison. But look out—the Time Twins have got all four Time Blades and are plugging them into the mech's Time Portal. Stop them before they spin that portal and take control of time! 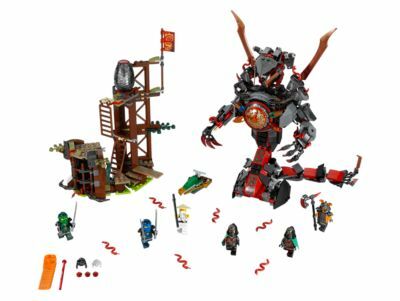 The Dawn of Iron Doom (70626) Lego set is no longer directly available from the sites below. However, 3rd party partners of these sites might still have the set available. Alternate description Take on the sinister Snake Mech with Lloyd and Jay! Includes six minifigures: Lloyd, Jay, Acronix, Krux, Commander Blunck and Master Wu. The Snake Mech features a dual minifigure cockpit, missile-shooting eye, posable head and arms, swishing tail, two big detachable blade weapons and spinning Time Portal with plug-in points for the four included translucent-colored Time Blades—Forward (green), Slow-Mo (blue), Pause (red) and Reversal (orange). Turn the wheel on the back of the mech to spin the Time Portal on the front. Detach the giant blades from the back of Snake Mech and place them in its hands. Clip the swamp fort together in alternative ways for different layouts. Weapons include Lloyd’s two katanas, Jay’s two katanas and Commander Blunck’s Vermillion axe and Vermillion sword. Accessory elements include Acronix and Krux’s Time Twin hoods and capes, Commander Blunck’s Vermillion helmet, plus six red snake elements. Snake Mech stands over 9” (23cm) tall. Swamp fort measures over 7” (19cm) high, 7” (20cm) wide and 4” (11cm) deep.